France Cycling Tours - Beautiful Cirque de Gavarnie . . . on MY bike! Last night my bike finally arrived, so I assembled it after dinner in anticipation of today's ride to the beautiful Cirque de Gavarnie. A cirque is a mountain shaped in a semi-circle, and this cirque is more than 10,000 feet wide and it contains France's highest waterfall at 422 meters or 1385 feet! the ride was relatively short in comparison to yesterday's ride, but it was quite beautiful. Here's a picture of Val and me at the end of the paved path to the CIrque, as well as one of me in the village of Gavarnie just before then. The waterfall is in the center of the cirque behind us/me. 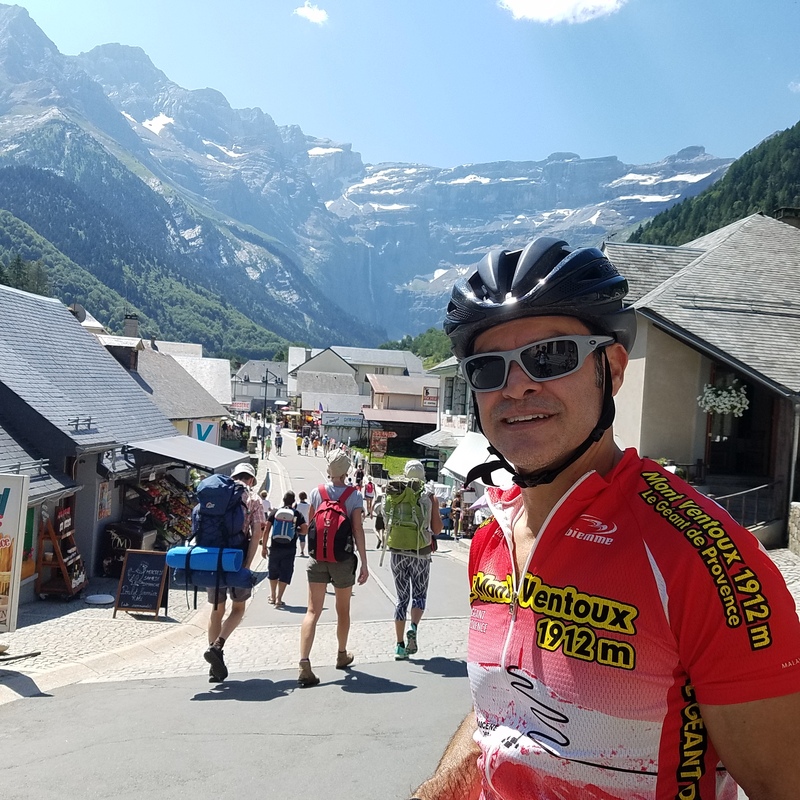 Afterwards we had a wonderful lunch in the village of Gavarnie, and then stopped for coffee in the village of Gedre on the way back to our rental hose, where we took this photo with the top of the cirque visible in the background. Mike and I then decided to climb the steep road back to our rental house, which climbs nearly 750 feet in only 1/2 miles. Along the way was this beautiful waterfall. For dinner we drove to the ski town of Cauterets, where we explored the town and it's carrousel and spa before having a fabulous fondue dinner. All in all it was a great day, and tomorrow should be just as great!